The Mayfair Hotel, now known as the Dunhill Hotel, is located at the corners of North Tryon and 6th Streets. Built by two local physicians, Dr. James Pleasant Mattheson and Dr. C.N. 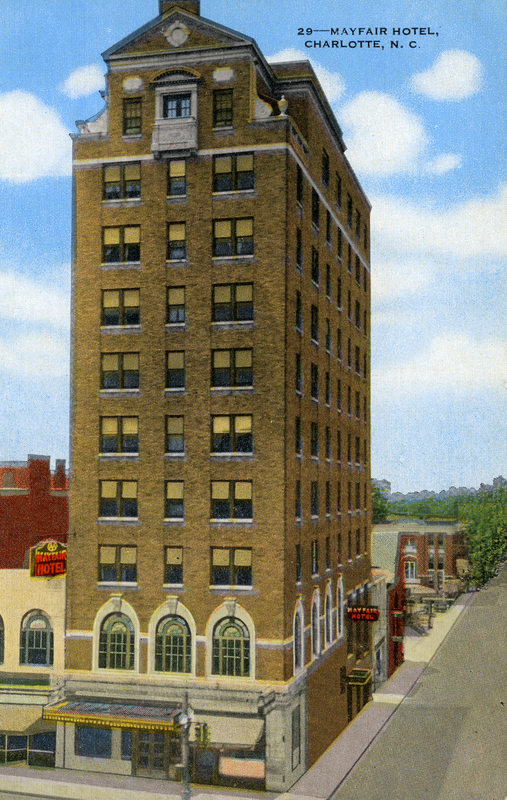 Peeler, the hotel opened its doors as the Mayfair Manor on November 15, 1929. Listed on the National Register of Historic Places, the hotel was designed by Louis Asbury. The Dunhill Hotel Associates restored the Mayfair to its present grandeur in the late 1980s, and changed its name. At the time of this postcard, Leo B. Vaughn, Jr. was the Manager. He took over for his father also Leo B. Vaughn who died in 1946. On the back of the card it reads as follows: The Mayfair Hotel, 100 rooms, one of Charlotte's most modern hotels is located in the heart of Charlotte's business district. All outside rooms with combination tub and hower. Free Parking-also Garage adjacent. Display and Meeting rooms. Golf privileges Myers Park Country Club. Group and Family Rates. Leo B. Vaughn, Jr. Pres. & Mgr.